Ah the sixties musobiopic, we meet again. This is a genre plagued by cliché, inherently bereft of suspense and often overshadowed by truly colossal egos. All too often we have stars smothered under bad wigs and prosthetics doing impressions rather than acting, struggling through scripts that bear the fingerprints of lawyers. There's only been one in the last decade that's really been artistically worthwhile; Todd Haynes' chopped and fucked Bob Dylan autopsy I'm Not There. In an optimistic twist, Love and Mercy shares a writer with I'm Not There (Oren Moverman). So is this that rare biopic that has something to say rather than playing it safe regurgitating the facts? 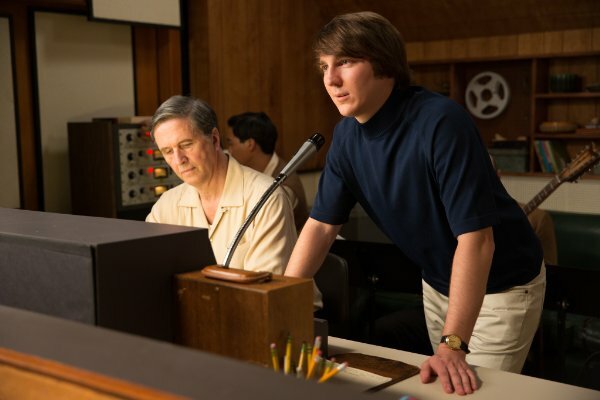 Love and Mercy certainly has a promising subject; former Beach Boy and musical genius Brian Wilson, known as much for his battles with mental illness as his dense, experimental pop compositions. Also optimistically, Love and Mercy experiments with a bifurbicated narrative. We alternate between the mid 60s, where a young Brian Wilson (Paul Dano) is fighting to create his genre-defining pop symphony and the 1980s where an older Wilson (John Cusack) has withdrawn into nervous isolation under tyrannical psychoanalyst Dr Eugene Landy (Paul Giamatti). Though the form may be rote, you can at least rely on the music biopic to sound great. It's arguably worth seeing this in the cinema purely to hear Pet Sounds and what would eventually become SMiLE played loudly over a cinema sound system. Atticus Ross, composing and sound mixing, makes this into an auditory treat. Instruments are intelligently isolated, rising and submerging in the mix to create a vague sense of what it must be like to devise this music. The highlights are the meditative sessions where Wilson lies back, closes his eyes and we hear a collage of fragments of songs playing over one another, sound effects and snatches of dialogue. This, more than anything else, gives us a window into the artist, listening as he processes his experiences and inspiration into his music. Sadly that proves to be the one true high point of the whole affair. Love and Mercy quickly indulges in some of my most despised musobiopic clichés. The most egregious offender comes when Brian's tinkling around on a piano trying to nail down a song. His brother helps him out, pointing out that a barking dog in the room is picking up "some good vibrations". Eesh. Later, there's even a moment where Wilson's abusive dad scoffs "Brian, in five years no-one will remember the Beach Boys, or you". This stuff is so cheesy/lazy - you'd think after the genre had been parodied so hard in Walk Hard writers would have taken note. Similarly bad are some clunkingly heavy-handed visual metaphors. At one point we find Wilson hanging onto an inflatable in the deep end of a swimming pool. His Beach Boy brothers sit on the steps; "Come on guys, join me in the deep end!" Wilson shouts. "No, we prefer the shallows" they reply. You can all but feel the director nudging your elbow, insistently whispering "get it.. get it?" The performances aren't exactly anything to write home about either. Paul Dano as the younger Wilson is the obvious highlight, managing to infuse this slightly portly, shy musician with a peculiar charm. There's an element of the child to his performance, from his conversational style to his physique. Cusack, by contrast, is a bit miscast. Bearing next to no physical resemblance to Dano (or Brian Wilson), he convey little if anything of what's going on inside his head. The enigma of Brian Wilson precludes any straightforward explanations, but Cusack can't even offer us theories. The supporting cast are all broadly okay, though something must be said about Paul Giamatti's diabolical doctor Landry. Chewing scenery like a starving man, Landry is depicted as a villain of comicbook proportions, probably one step away from donning a suit of power armour and swearing revenge on Batman. The cherry on top is a completely ridiculous wig that constantly threatens to upstage Giamatti.. He plays it very over the top, but I can't deny that it's entertaining. I wish they'd given him a moustache to twirl sinisterly. Love and Mercy is, sadly, just another bog standard musobiopic. There's glimmers of experimentalism in there and some top class sound design that might edge it towards watchable, but knackered genre conventions are in full force. If you're a Brian Wilson fan you'll eat it up, if you like The Beach Boys music it'll be a diverting enough experience. Sadly, Love and Mercy never quite finds its own angle on its subject, making it a missed opportunity.